This is the official page for the Seattle Times’ print and online newspaper. The site offers 24 hr. news updates, has a readership of 1.8 million, and more than 5 million unique viewers per month. 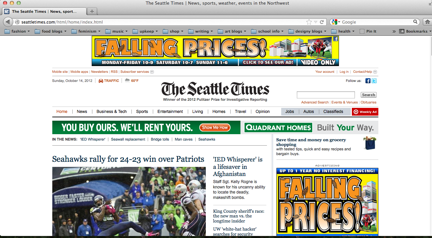 The newspaper’s online network includes seattletimes.com as well as marketplace sites NWjobs, NWautos and NWhomes. Design overview: All categories are neatly organized at the top of the screen, easy to navigate. The overall design is like many news websites today, with quadrants separated for different categories from the top navigation. A few big ads (some pop-up), which are necessary for survival. There is one main image and a few other smaller ones throughout. There is a sidebar on the side for trending stories, those most shared on Facebook and many info links throughout the bottom. Audience: Primarily Seattle, Puget Sound residents. Business/site goals: To generate revenue through advertising and share local news and syndicated AP content with readers. Social media integration: There are many blogs for different genres on the site, (politics, etc.). There is a follow us section with Facebook, Twitter and a recent Facebook activity section. You can sign up for newsletters for specific news sections and add it to your RSS feed.